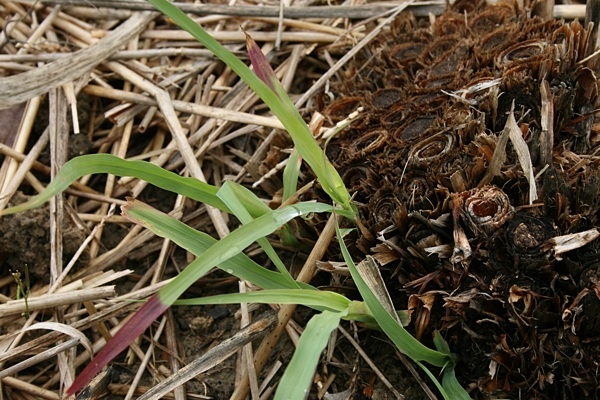 I saw my first black widow spider many years ago – in a box of mail-order plants I was unpacking. Nothing bad happened. I smashed it with a trowel and it made a good story and I assumed I’d never see another. 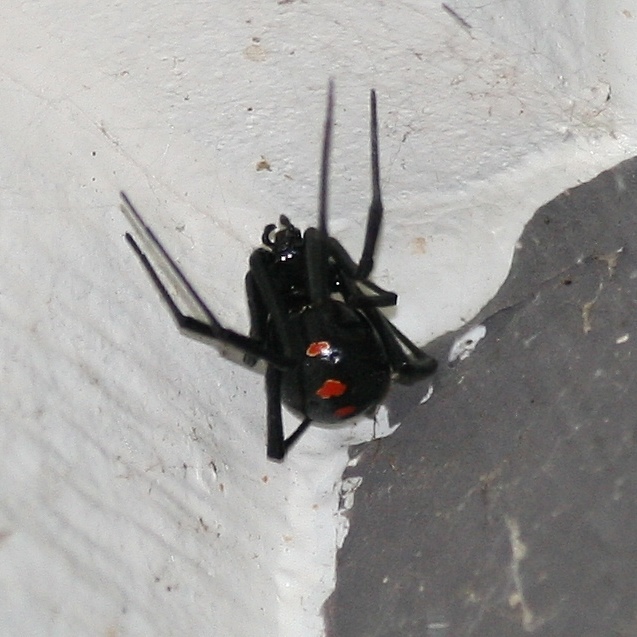 I saw my second black widow spider here in the woods of central Virginia. It was a few years ago, maybe 2007 or 2008. I probably should have killed it. I saw my third black widow spider on Monday of this week. On my front porch! I knocked it down and stomped on it with my garden clogs. 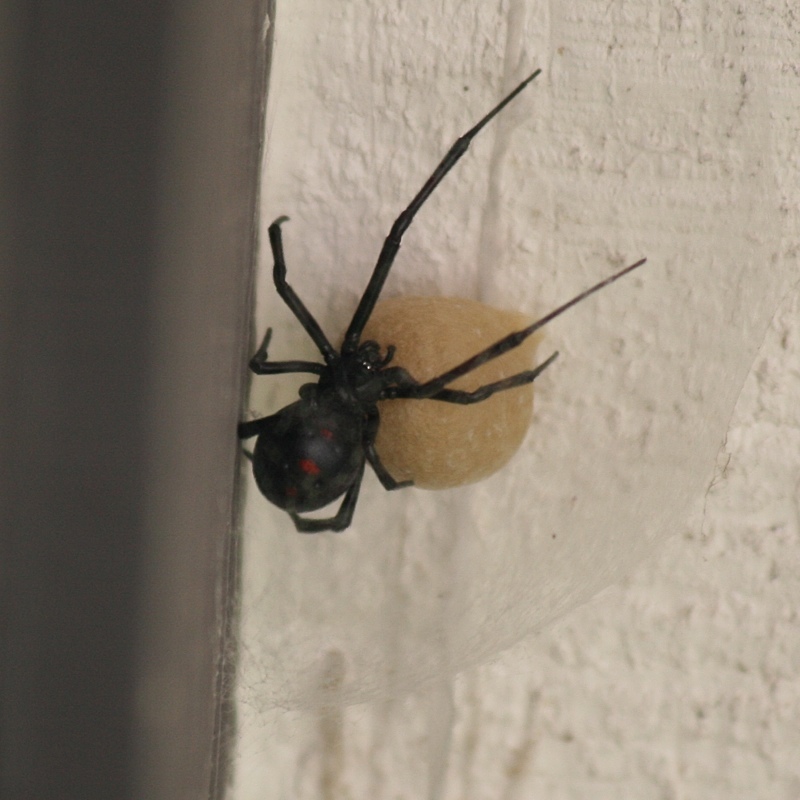 I saw my fourth, fifth, sixth, and seventh black widow spiders yesterday. All in various place on the outside of our house. But now some of them were busily making babies. I shredded my green credentials and called an exterminator. I really hated to do it, but we just can’t have so many of these things around. Everything I read about them says they inhabit damp dark spots generally hidden to human view. Well I don’t know about that – all the ones I’ve seen have been clearly out in the open. With the exception of one that was on the foundation nestled up against the first row of siding, all the rest were under the eaves of the house and garage. How many more are there in those damp dark hidden places? Garden Bloggers’ Bloom Day? Wildflower Wednesday? Foliage Follow-up? Harvest Monday? These are all great community-building projects, but……I’m tired. Oh and what about Facebook and Twitter? I’m there, but not very enthusiastically. Twitter was fun when I was following a small number of people, but now I just browse the stream for a short time every few days. Facebook, well, you all know the issues with Facebook. All this is by way of introducing my newest internet gardening project. I noticed that people and organizations are using MediaWiki – the software that powers Wikipedia – for all kinds of interesting things. Tatiana’s TOMATObase is a wonderful reference. I signed up a few months ago with WeRelate – a non-commercial genealogical wiki. And I starting thinking. 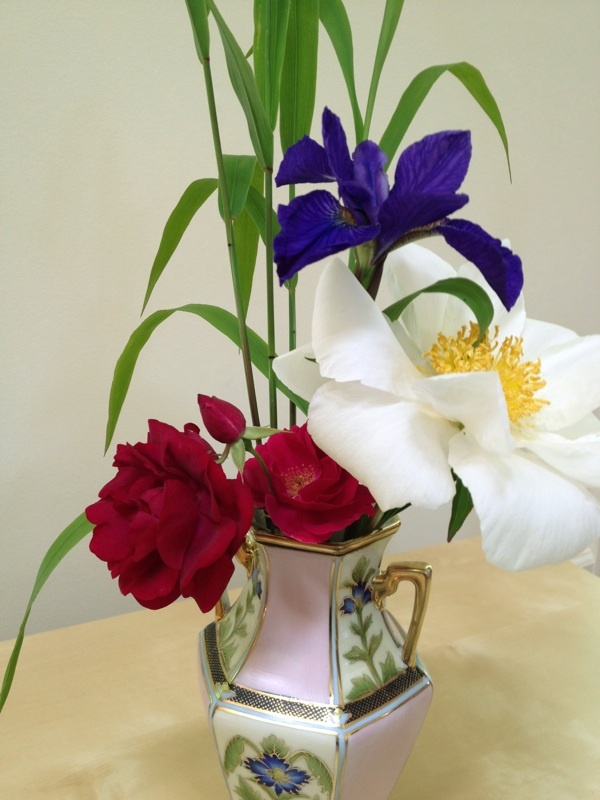 I really intended this blog to be a gardening journal. Then when blogs got popular, I started writing posts that I thought would please other people. Far from what I intended when I started. But what if I had a personal gardening wiki? It could be an even better version of what I thought I’d have when I started this blog. 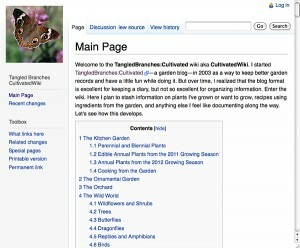 Introducing CultivatedWiki. Now, this is very much a work in progress, so don’t go there looking for a complete garden encyclopedia. I’m adding to it a little at a time. Eventually, if I stick with it, it should be a good record of my gardening activities. Right now I have no plans to make it collaborative. It’s just a personal record which may or may not be interesting to others. I don’t know what to do about this blog. For the time being, I’ll keep it around. Maybe I’ll do a weekly summary or something. Or just post when I have something new and different to say. 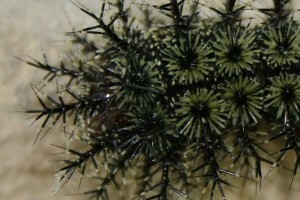 Venomous caterpillars? Yes. If you see one of these things, don’t touch it. Even if it’s dead. If you want the graphic version of the warning, click here. I suspected this might be one of the several types of venomous caterpillars, even though I didn’t know what it was when I took these photos. Those spines just look ominous. Click the photo above to enlarge it. You’ll see that each spine looks like a micro hypodermic needle and that is essentially what it is. These critters were crawling all over the outside of the house yesterday afternoon. The experts say they’ll be around for a few weeks and then will burrow and pupate to turn into spectacular moths. Thanks to the folks at the excellent bug site bugguide.net for the ID. 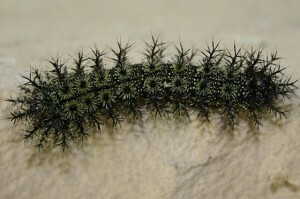 If you want to know about other caterpillars you shouldn’t touch, the University of Kentucky has an illustrated guide. Herb of the Year? Says who? The International Herb Association will have you know that the 2012 Herb of the Year™ is the Rose. They’re a trade organization so I suppose that little trademark symbol is inevitable, but it still made me squirm. And this upcoming week is National Herb Week—as declared by the International Herb Association. Or if you don’t want to spend a whole week on it, there’s HerbDay—May 5 this year—brought to you by a consortium of various herb organizations. Isn’t there some kind of official proclamation for these things? I couldn’t find one anywhere and I googled for at least 30 seconds. Anyhow, we kicked off our herbal celebrations a little early by visiting Herbs Galore & More last Saturday at Maymont in Richmond. It was a good plant sale, although most of the vendors didn’t have much to do with herbs. I’m planting more herbs this year, after concentrating the last few years on vegetables. Fresh herbs are so expensive to buy as food (farmer’s markets, grocery stores) and so easy to grow (seeds, nursery plants). A few weeks ago I started seeds of my favorite basils which aren’t always easy to find as plants, but readily available as seed—Mexican Cinnamon Spice, Mrs. Burns Lemon, and Sweet Petra Dark. I’m going to start more basil seeds in a couple of weeks, so they’ll be still be young and fresh when the tomatoes are ready. I’ve read that in Liguria, home of pesto, basil plants are grown quickly under glass and the entire plant is harvested when still quite young. For better flavor or a better bottom line? I don’t know, but I’ll assume they know what they’re doing. The selection of basils at the Maymont show was overwhelming, but I came home with only one basil plant – Cuban. I hadn’t heard of it before, but I loved the fragrance. Up in Northern Virginia, I shopped for herbs (and more) yesterday at DeBaggio’s. The first time I visited there, years ago, it was in the middle of nowhere. Last time I went, suburbia was encroaching. Now, DeBaggio’s is a rural holdout, totally surrounded by housing developments. The plant selection is outstanding if you’re interested in edible and aromatic plants. And some well-chosen ornamentals too. But back to the Herb of the Year™. Yesterday, I cut a few flowers for the house—’Krinkled White’ peony, ‘Vi Luihn’ Siberian Iris, and ‘Hugh Dickson’ rose. It’s astonishing to me that roses are in bloom here in the first days of May, and what’s more astonishing is that my ‘Hugh Dickson’ is blooming. I tried to evict him from the garden in 2005 and thought I’d succeeded, until last year. I started to see rose shoots where he used to be, but I thought, “Well, they were probably grafted plants. This is probably some weedy rootstock that survived.” But no. Those shoots are now blooming and they do appear to be ‘Hugh Dickson’. Hugh has a good pedigree, bred by the illustrious Dickson family of Northern Ireland. I remember that I chose him based on a catalog description of the fragrance and disease resistance. The fragrance is fabulous, but disease resistance? I guess that just means that it doesn’t get blackspot and mildew as bad as some other roses do. I considered making that bouquet my entry for this week’s Garden to Table Challenge. It was on the table, but the combined fragrances were too overpowering and now it’s in the family room where I can still catch whiffs of it as I sit at the kitchen table and type this. But I searched my memory, and remembered that early in the week, I did make food with garden ingredients. It was a Caribbean-style Black Bean Soup, made with a sofrito including Ají Dulce and Brown Habanero peppers from the freezer, and topped with chopped fresh scallion from the garden when finished. My version was adapted from a recipe in an old Time-Life cookbook, but this recipe is similar although much more complex. What’s cooking in your garden lately? Join the party at GreenishThumb.net. 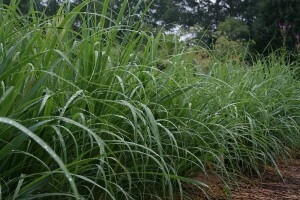 At the risk of repeating myself again, today I’m going to write about lemongrass. For the last couple years, I’ve started lemongrass plants from grocery store stalks. 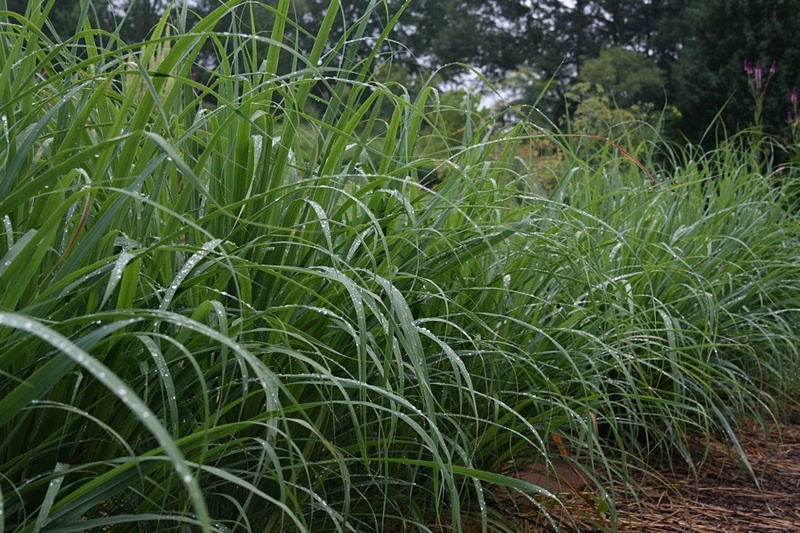 You can read my previous posts ¹ ²to see how I did it, but the basic idea is to buy lemongrass at the grocery store, root it, plant it, watch it grow, eat it, and repeat the whole process next year because lemongrass is a tropical plant and won’t survive a central Virginia winter. Or will it? 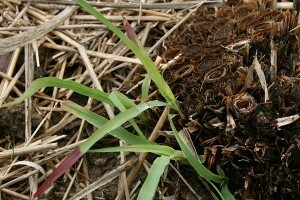 Cleaning up the garden, I was surprised to find fresh green shoots at the base of last year’s lemongrass plants. It was a warm winter, but that warm? Cymbopogon citratus is said to be native to southern India, Sri Lanka, Indonesia and/or Malaysia. None of those places ever have freezing temperatures as far as I know. But freezing is exactly what I did with last year’s lemongrass stalks. Late last fall, I cut down just two of the clumps, separated the stalks, trimmed off the top part so they’d fit in a gallon-size freezer bag, and this year I probably used more lemongrass in the winter than in the summer. I think you have to use more than recipes suggest because the freezing seems to diminish the flavor somewhat, but otherwise I don’t think you could tell the difference between frozen and fresh. I don’t have any original ideas for using lemongrass, but I have a lot of cookbooks and Google. I found a recipe for Lemongrass Shrimp on Rasa Malaysia and have made it several times. Quick, easy and good! Are you cooking from your garden? Or a local farmers’ market? Tell us about it! 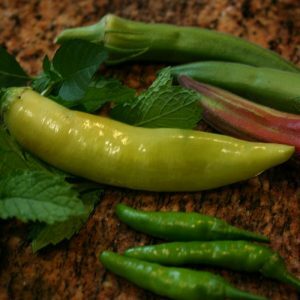 Go to greenishthumb.net and join the Garden to Table Challenge. Having only just written that I plan to shrink the garden to where it provides fresh food in season for two people and that’s all, I’m now going to write about the satisfaction of food preservation. If I hadn’t put last year’s surplus into the freezer, fridge and dehydrator I wouldn’t have much to contribute to this week’s Garden-to-Table-Challenge. And as we cycle through our seasonal favorites I’m afraid of repeating myself too often, but here goes. Herb Vinegar. 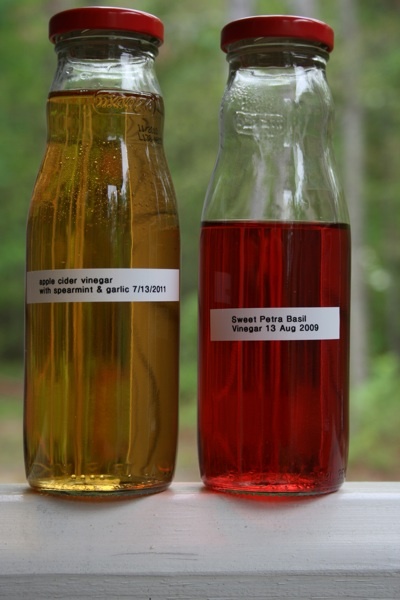 A few drops of vinegar or citrus juice almost always improves whatever you’re cooking. That little bit of extra acidity seems to bring other flavors forward. But season the vinegar with herbs and you’ve added another dimension. Making herb vinegar is so easy and rewards you so much for very little work. The finished product will last a long time because you only use a few drops in any given dish. I even have some vintage herb vinegars from previous years still in the fridge. When I last wrote about herb vinegar, I was contemplating whether to combine garlic and herbs or to make a batch with garlic alone. I decided to combine garlic with ‘Kentucky Colonel’ spearmint in a base of apple cider vinegar. I strained it into another bottle after several months to conserve space in the fridge. Generally speaking, I liked the combination, but next time I think I’ll go back to my favorite rice vinegar as the base. It’s happy to be the quiet assistant while the herbs are the stars of the show. The apple cider vinegar added too much of its own flavor to suit me, but it might work better with different herbs. Anyhow, I used it this week in a little relishy sort of thing to go on shrimp tacos. I make a sort of simplified version of Camarones Brochettes by threading a slice of bacon over and under shrimp on a skewer. Add a hot pepper to each skewer. The hot peppers were from last year’s garden via the freezer. More about that in a minute. Grill until the shrimp are cooked through (try not to incinerate them with bacon drippings on the charcoal…ahem) and have each diner assemble tacos in flour tortillas (or grocery store rotis in this case) with any toppings (s)he likes. This time it was salsa (store-bought, but the spouse likes it) and this relish: chopped green onions, minced ‘Peach Habanero’ pepper, salt and a few drops of mint/garlic vinegar. We dunk shrimp tacos in garlic butter as we eat. The green onions from last year’s seed onions are starting to flower, so I need to use them up soon. So we had a few cebollitas with our tacos. I wrote about cebollitas last year, but the short version is throw some green onions on the grill; season with salt, pepper, and lime juice; eat. OK, now about those hot peppers in the freezer. This is one area where I just can’t shrink the garden too much. We use a lot of hot peppers. There are so many types and flavors that I just can’t go back to buying them in the grocery store, not even in the big international supermarkets we have now. 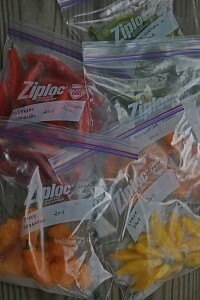 Peppers are simple to freeze – no blanching or other preparation required. Pick them, put them in a plastic bag and put them in the freezer. Then be smug and happy until the next crop is ready.